How Risky Is General Electric Company Stock? 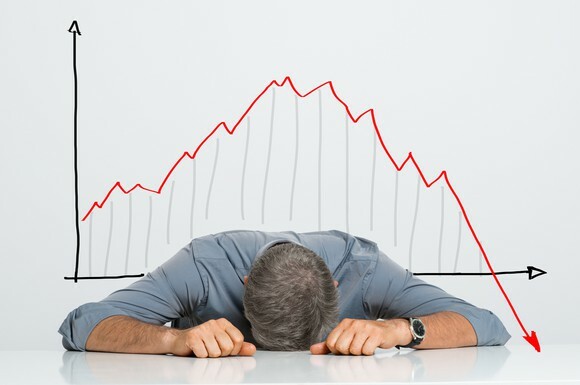 General Electric Company (NYSE: GE) is an American icon that has fallen on hard times. Although the industrial giant faces significant difficulties today, it's likely to survive this storm -- and assuming it does, there will be material recovery potential in an investment here. 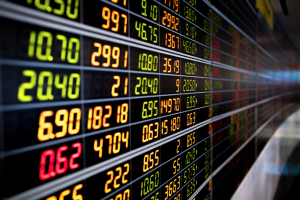 But just how risky is General Electric Company stock? Here are some issues you'll want to consider before you buy. The current problems GE faces didn't crop up overnight, but built up over a long period of time before coming crashing down. The aftermath has lingered for more than a decade. The genesis of today's issues dates back to GE's former chairman and CEO Jack Welch. It was under Welch's watch that the finance division was allowed to grow and expand beyond its intended role (supporting sales of GE industrial products) into unrelated businesses (such as mortgage lending). These problematic seeds were sown by Welch before his successor Jeff Immelt took over in 2001. During the 2007 to 2009 recession, GE's finance arm caused the company severe financial strains, major asset sales, write offs, a dividend cut, and an embarrassing government bailout. Immelt took action to turn things around, including paring back the finance division. But he made some bold bets on struggling industries that didn't pan out, or at least not quickly enough. Expanding into the energy industry left GE with a debt-laden balance sheet and struggling operations. The board of directors brought in a new CEO in 2017, industry veteran John Flannery, who quickly announced restructuring plans, including asset sales, write offs, and a dividend cut. After roughly a year, however, the board wasn't pleased with the progress, and brought in outsider Lawrence Culp. Culp announced a new set of restructuring plans and asset sales, and brought the dividend down to a token $0.01 per share per quarter. Today, Culp has only been at the helm for a few months. There's a good chance 2018 will be a kitchen sink year, with Culp trying to push any big charge he can into the year to start 2019 with a relatively clean slate. In other words, there could be more painful news ahead when General Electric announces fourth quarter earnings. That's not a bad thing, per se, as it sets up a brighter future and this could end up being a turnaround investment story. But all of the charges being taken have dramatically changed the company's leverage profile. 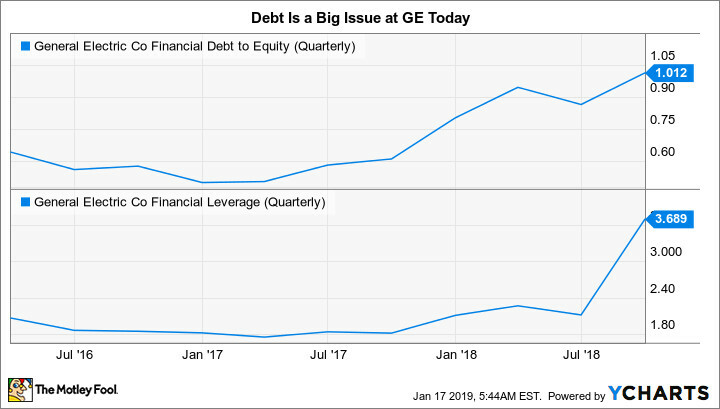 At the end of the third quarter, long-term debt made up roughly 75% of GE's capital structure. That's a pretty high figure for a company that operates in a cyclical industry where earnings fall sharply during and after a recession. This nature puts pressure on management to work quickly, particularly today with the current U.S. expansion looking long in the tooth and countries around the world showing signs of slowing growth. Working too quickly, though, can lead to mistakes. For example, some market watchers have questioned GE's decision to sell a substantial portion of its Baker Hughes, a GE Company stake, wondering if this is a fire sale driven by a desperate need for cash to reduce leverage. The company is also looking to spin off its healthcare division, once considered a crown jewel. It's easy to see how some might fear that GE is so weak that it has to sell some of its best assets. There are also lingering concerns that the pain isn't over yet for the company's finance arm. It's unclear how GE will make up for the loss of valuable cash flow provided by the businesses it's divesting. Simply put, there are a lot of moving parts and GE is not operating from a position of strength. Will all of this work out? In the long run the answer is likely to be yes. However, there's a great deal of uncertainty today, and the industrial giant's leverage creates material time pressure to find solutions. GE is, at best, a turnaround stock right now. The turnaround designation is very important, because it should immediately cause conservative investors to take pause. GE is an industrial icon, but only aggressive investors should tread into the turnaround space. There's just too much uncertainty -- a lot of things have to go right for a turnaround to work out. And, in this case, there is a very real risk that high debt levels will force the company into a strategic mistake. 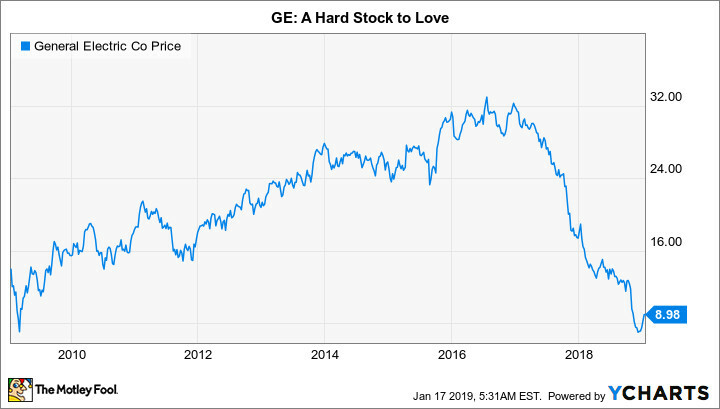 Despite the allure here, most investors should stay on the sidelines until more progress has been made in restoring General Electric's business. On that front, 2019 should be a very telling year.